Our Fall 2018 classes and activities booklet is available. Visit the church to pick up your copy or click here. Director: Ruth Anne Luckenbaugh, rluckenbaugh@annandale-umc.org. Children are a vital part of our ministry. We invite children to have fun and learn about God’s love for them. We offer activities for 2-year-olds through fifth graders, including weekly Sunday school (9:45 a.m.) and children’s choir. 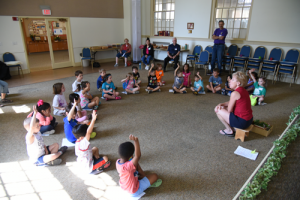 We offer two preschool classes for young children, using the Frolic Curriculum: Little Lambs—for children who are 2 or 3 years of age, and Little Goats—for children who are 4 or 5 years of age. Our elementary age children use Godly Play, a method of Christian formation and spiritual direction for children. The goal is to teach children the art of using religious language to help them become more aware of the mystery of God’s presence in their lives. Bible stories are told with objects and encourage children to enter into the stories and relate them to their personal experience. Child care is available for infants through preschoolers during worship services and church events in Room 207. For more information, contact Ruth Anne Luckenbaugh, Director of Christian Education for Children, at rluckenbaugh@annandale-umc.org. 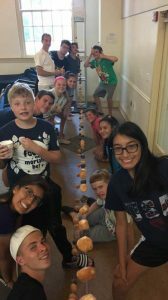 AUMC provides sixth through twelfth graders with a safe space to grow and explore their faith. We offer two Sunday school classes for middle and high school youths, beginning at 9:45 a.m. Our Middle School Class meets in Room 209 at 9:45 a.m. Our High School Class meets in the Youth Room (Room 105) at 9:45 a.m.
We also have a program on Sunday evenings, 5:30-7:30 p.m., called Ramp. The photo shows one of our previous Ramp activities, Donut Olympics! For more information, contact Rev. Peter Kwon, Director of Youth Ministries, at pkwon@annandale-umc.org, or click here to visit the Grid on Facebook! Young adult ministry at AUMC is for young adults, ages 18-35, who are interested in studying God’s word, sharing in Christian fellowship, and serving together in mission. 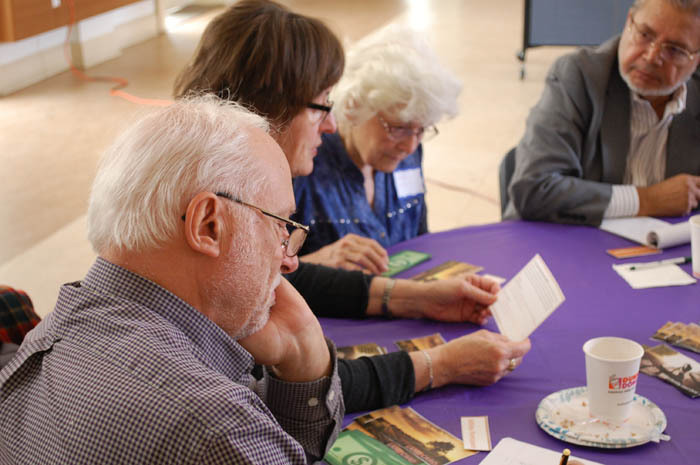 Once a month we gather at a restaurant at 12:30 p.m. for a lunch and Bible study, as we dive deeper into the day’s sermon and discuss how it applies to our everyday lives. We hope you come join us for this time of food, fellowship, and discussing God’s Word. 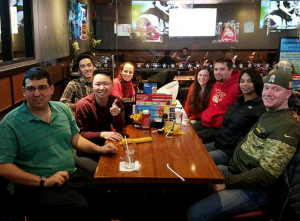 The Young Adults participate in a wide variety of other fellowship and mission activities including everything from movie nights and Superbowl parties to packaging meals for the hungry and writing Easter cards for human trafficking survivors. To be added to the AUMC Young Adults email list, contact Rev. Peter Kwon, pkwon@annandale-umc.org or 703-256-8330. Our Academy of Discipleship offers adult Sunday school, mid-week classes, small groups, sermon studies, guest lecturers and more. The Academy is led by Rev. Jason Micheli. Contact him at jmicheli@annandale-umc.org with questions. Starting your discipleship journey can feel overwhelming. Where should you begin? The Core 5 courses are great first and next steps to a clearer understanding of what it means to become a deeply committed Christian. We recommend (but it is not required) that you take these classes in order of 1-5. Annandale DNA: If you are considering membership at Annandale, attending this quarterly session will help you learn more about the church’s mission and core values, our pastors, and an overview of expectations regarding membership. H2O: This course is open to anyone who has a thirst for knowing more about the Christian faith. Regardless of where you are in your faith journey, H2O is a place where your questions and curiosity are welcome. 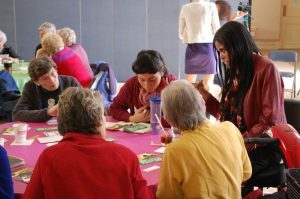 This course includes a talk, food, and discussion. Journey 101: Journey 101 is designed to create environments where people experience growth and support as they engage in the discipleship journey. The focus is on Knowing God, Loving God, and Serving God through exploring scripture and learning new spiritual practices. This class meets on Thursdays at 7 p.m. in Room 209. The RAK Project: RAK (Random Acts of Kindness) is a family friendly and intergenerational service activity that includes painting inspirational rocks to share with neighbors, friends, or strangers as a way of spreading the good news of God’s love for all people. RAK is held quarterly. Disciple Bible Study: This course provides foundational and comprehensive overview of the Bible. Groups vary in format and length. It meets on Wednesdays at 7 p.m. in Room 210. 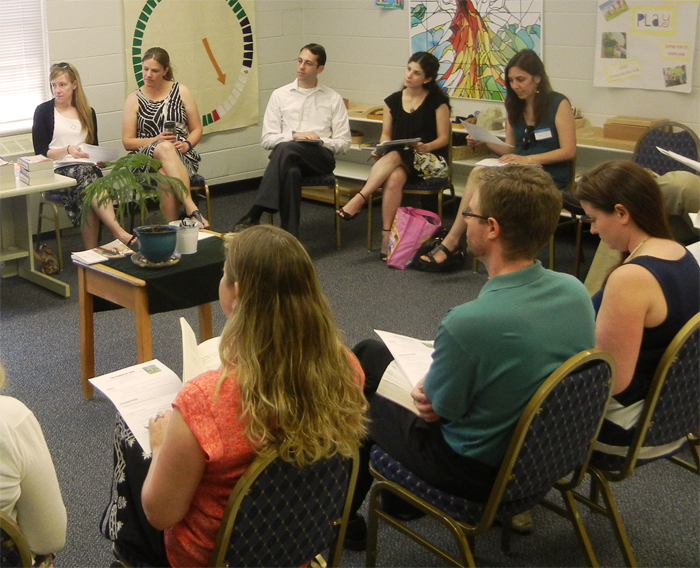 Our adult Sunday school classes meet from 9:45-10:45 a.m. at the Annandale main campus building, 6935 Columbia Pike. Click here to learn more! WILLIAMS BIBLE CLASS, Room 118. This is AUMC’s oldest Sunday School class. It has evolved into a women’s group with Bible Study and informal discussion. This class rotates leadership. We have activities every day of the week, ranging from serious Bible studies to a running group! Click here to check our group list and find one that's right for you. PRAYER AND PRAISE: Meets Wednesdays at 7:30 a.m. in room 307. This weekly Bible Study group prays, studies, and fellowships together weekly. They often invite guest speakers to lead their discussions. Leader: Rudy Meekins. 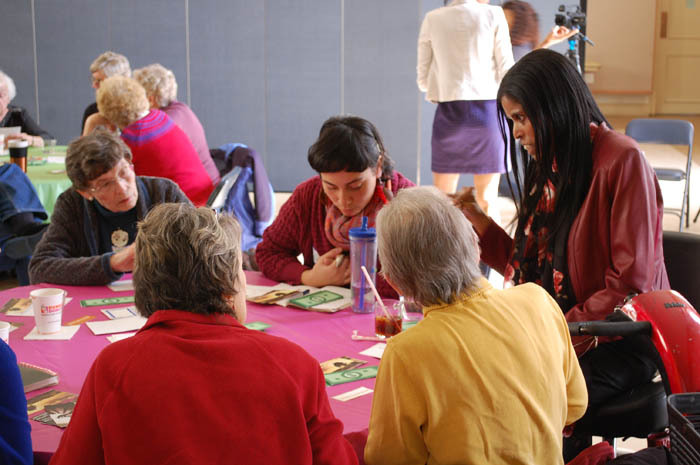 Annandale also hosts a variety of fellowship groups – visit the Groups page to learn more! 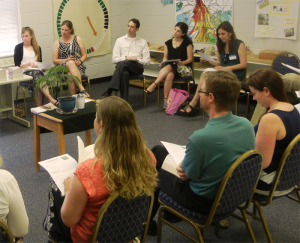 The FaithJustice Forum is a joint ministry of Annandale UMC and the FaithJustice Foundation, founded by one of AUMC’s previous pastors, Rev. Cynthia Johnson-Oliver. The forums explore how faith impacts the important social justice issues of our time and how people of faith are called to speak and take action in ways that do justice, love mercy, and walk humbly with God. 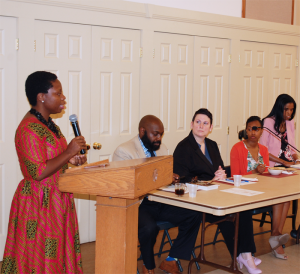 FaithJustice immigration forum: “Hospitality, Sanctuary, Advocacy,” May 5: Join us for the next FaithJustice Forum on Sunday, May 5, at 1:30 p.m. in Wright Hall. From providing legal services to traveling to the border, this panel will discuss ways that people of faith are fulfilling our biblical calling to welcome the stranger and to oppose injustice and oppression. Learn more and RSVP online at www.faithjusticefoundation.org/event/immigration-forum/. 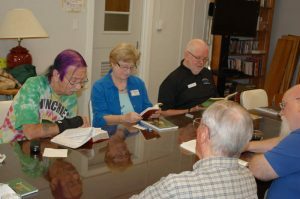 Learn more about upcoming activities at faithjusticefoundation.org.